"Dr. Seuss said it best – 'If the rest of the journey is as nurturing as the beginning, there’s no telling how far the children will go!' Thank you for everything!" Letter R week was Really Riveting and Really Rainbowed! Be sure to Read below to find out all about it! On Monday and Tuesday morning, the students worked on their letter R tracing and identification activity pages. The students who are usually very attentive and focused while working on their morning work had a bit of a tough time paying attention on those sunny mornings. This was because while they were working, the classroom rainbow maker that is adhered to the window was projecting tiny rainbows all around the classroom walls and ceiling, and every once in a while on the morning work tables! Even despite the rainbow excitement, the students got back to work and did a great job! In the afternoon, the students created their Letter R list. The list was coming along quite nicely but things got a little tricky when one student called out the word “Artist”! Hearing the “R” sound in the beginning of the word artist, the student was so proud of his addition to the list. The teachers all smiled and assured the student that while it did have the R sound in the beginning it actually started with A. Thankfully one of the students in the class has a name with the similar circumstance which helped clarify things a bit! Tuesday’s list and hunt was equally as tricky when “Aardvark” was suggested for the list. It is a good thing the students have encountered tricky letters before – i.e. vowels changing their sounds and letters like G that say both “guh” and “juh”. Wednesday morning began with a read aloud of Crockett Johnson’s hit, Harold and the Purple Crayon. In the story, Harold, a little boy who gets sent to his room, decides to go on an adventure. With the help of his purple crayon, Harold draws various scenes that lead to exciting travels and adventures far beyond his bedroom walls. Much like Harold, the students of Park Prep had an opportunity to use their own magic writing implement to create their Wednesday “Magic Rainbow Art” project. In order to create Wednesday’s art project, the teachers prepared special “magic” papers the day prior. 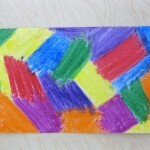 First, the teachers used crayons to very firmly color a large cardstock paper like so. Next, the teachers mixed black tempera paint and some liquid dish soap together and spread a think layer over the waxy crayon colorings. Left overnight, the paint dried and the “Rainbow Magic” papers were ready for the students! Using the opposite end of some magic paintbrushes, the students pressed firmly create a rainbow design on the magic paper. When the paint was scratched away, the colors beneath were revealed -or as the students thought, magic happened! The students had a blast creating their magic Rainbow art. F.Y.I. 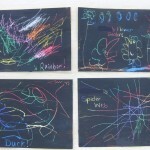 – This scratch art project is a fun and easy craft to repeat at home! Just keep in mind the advance planning necessary. This week, the students wrapped up “La Cara” (the face) unit in Spanish class. In the afternoon on Wednesday and Thursday, the students practiced identifying the parts of the face as well as using gentle hands as they worked with a partner to softly touch the various part of their friend’s face. Here is a video of dos amigos working on their La Cara activity. 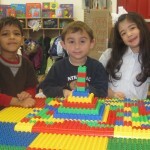 On Thursday morning, the students’ fine motor abilities were challenged as they worked to create their rainbow. 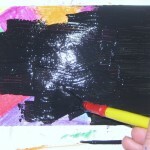 Using skinny paintbrushes and rainbow colored paint, the students had to brush over thin corresponding color lines of a pre-drawn rainbow. The students worked diligently to complete the activity and really impressed the teachers with their ability to stay focused on the difficult task at hand. Once the painting was complete, the students used cotton to create puffy clouds at the base of their rainbow. Here is what the final result looked like. Friday began with some Really Radical shares! 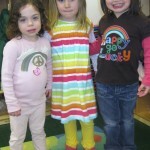 Some of the students were dressed as rainbows! One student brought in a rocketship launcher and the students loved it! Watch below to see the students counting down to the rocket’s launch! After the shares had been completed, the students began working in their morning stations. 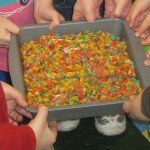 For morning work, the students got to prepare a special Letter R Week Rainbow treat – Rainbow Rice Krispy Rectangles! With some help from the teachers, the students combined the ingredients together and used cookie cutters to create the rectangle rainbow treats. The treats were the perfect addition to a Friday lunch! 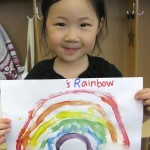 In the afternoon, the teachers compiled photos of rainbows in the sky to show the students. They also reviewed the fact that a rainbow can only be seen after rain. One student was overcome with excitement as he shouted, “It’s raining today! We will see a rainbow!” Unfortunately, the key ingredient missing was the sun. The teachers assured the students that with Spring just around the corner, there will be plenty of rainy and sunny rainbow hunting days to look forward to! Well, that’s all for Letter R week. As always, we hope you enjoyed Reading this week’s post. See you next week!